If you have come here to learn about motivating students to pursue an engineering education, you have come to the right spot. I believe that an engineering education is the best education that anyone can obtain. Engineering school teaches you how to think. It teaches logical and analytical thinking skills that help in everything that you do. It prepares you for your life like nothing else can. This is my personal blog. It is focused on motivating students to pursue an engineering education. My mission is to is to provide, or help you provide, information resources to promote, guide, and stimulate interest in Science, Technology, Engineering and Math (STEM) with a particular emphasis on “E”ngineering. Because engineering is a way to change the world, I strive to expose large numbers of students to the capacity they will have to benefit society. As a result, I write on motivating students, newly available resources, and all things K-12 engineering that I think can help you. On occasion, I write about stuff that doesn’t fit neatly into one of these categories. My goal is to create insightful, relevant content that you can put to work in your personal and professional life. If you seek to inspire the next generation of leaders, gadget makers, and game changers, then this blog is for you. I typically post once or twice times a week. To make sure you don’t miss my newest posts, you can subscribe via RSS or e-mail. 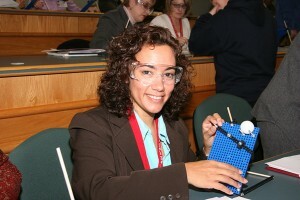 I began this journey back in 1997 when I wrote the 1st edition of “Is There an Engineer Inside You?” Shortly after, I began working at a Science Teacher Training Center and wondered why there were so few places training K-12 teachers to teach engineering. In 2002, I founded the Engineering Education Service Center to get more teachers involved in teaching engineering and to create ways to open the doors for student exploration. The Norm Augustine Award from the National Academy of Engineering (The Norm Augustine award is given to an engineer who has demonstrated the capacity for communicating the excitement and wonder of engineering). The American Society for Engineering Education’s (ASEE) Engineering Dean Council’s Award for the Promotion of Engineering Education and Careers. The Rochester section of the IEEE Engineering Education Advocate Award. The Boston Society of Civil Engineers Clemens Herschel Award for publications that enable teacher to take on the task of demystifying the engineering profession for middle school students. The John Green Award from the Tulsa Engineering Foundation. Last year, I wrote the books and training materials for every K-12 teacher in the state of Oregon to use the Engineering Design Process to enhance the teaching of science. I’m listed on the National Engineers Week website as one of 50 engineers you should meet and I’ve been named one of the Nifty-Fifty individuals who have made a major impact on the field of engineering by the USA Science and Engineering Festival. I’ve spent the past dozen years advising students and parents on the challenges and benefits of obtaining an engineering degree by providing fun and engaging presentations and workshops for schools, colleges, universities, and organizations. The talks are fun because most people don’t know how much you can do with an engineering degree and/or how it can allow you to follow your dreams. numerous high schools and many more. Currently, I live in Springfield, OR with my spouse and three dogs. I play competitive table tennis and although I haven’t personally measured it, I’ve heard that a ping pong ball slam can reach 100 m.p.h. That is one of my many goals for 2014. You can contact me via email or follow me on Facebook or Twitter.